– Insert the flat-blade side of the reversible screwdriver insert into the slot on the number plate light ⇒ fig. 310. 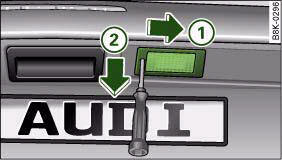 – Using the screwdriver, start by pressing the number plate light to the right -arrow 1- and then pull the number plate light downwards from this position -arrow 2- and out of the opening. – Detach the number plate light. 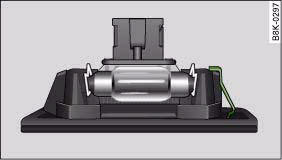 – Press the defective bulb out of the bulb holder and fit the new bulb. – First insert the side with the retaining element, fig. 311 and then carefully press the number plate light into the opening. – Check whether the new bulb is working.